Every culture in the world has a pastry covered sweet or savory recipe like latin empanadas,chinese springroll and wantons etc which i think is always a winner with everyone. And our's is samosa and kachori and who doesn't like these two snacks . "Kachori" is this months recipe for ICC . There were recipes for moong,matar and pyaz ki kachori @ICC for everyone to try. Since i had tried my hands at matar ke kachori previously decided to prepare Pyaz Ki kachori for the challenge. Thanks Meedha and Srivalli for the wonderful recipes. 1. Mix the flour and salt, Add the oil/ghee and mix till you get a bread crumbs texture. 2. Slowly add water and make a soft dough. Knead well for about 8 minutes. Keep the dough covered at all times, if not it will dry up and not puff up when frying. If the dough is made right wet cloth can be used if not just a towel. Dough is not soft enough. Not kneaded for enough time. 1. Heat the oil in a pan. Add the nigella seeds, fennel seeds, bay leaves, green chillies and onions and sauté till the onions turn light brown in colour. 2. Add the gram flour, coriander powder, chilli powder, garam masala and salt and sauté for 2 to 3 minutes. 3. Add the chopped coriander and mix well. 4. Remove the bay leaves and discard. 6. Divide into 12 equal portions and keep aside. 1. Make a small ball from the dough. 2. Roll out into a 2 inch diameter circle. 3. Or flatten the ball using your fingers having the center thick and sides little thin. 4. Place about 1.5 tsp of the filling in the center of the rolled dough. 5. Cover the filling with the dough by slowly stretching it over the filling. 6. Seal the ends and remove excess dough. 7. Repeat with all the balls and keep aside for 5 -7 mins. 8. Then using your palm, flatten the balls by lightly pressing it, as using the rolling pin will make the filling come out. (See notes below). Keep aside covered. Repeat with the remaining dough. 9. Meanwhile heat some oil for deep frying. 10. The oil should not become smoking hot. 11. Test to see if the temperature is right by dropping a tiny ball of dough and see if it is rising slowly to the top. 12. Drop the kachoris in batches of 3-4 gently into the oil. 13. Cook both sides till both sides are golden brown and delicious. You can fry 3 kachori's at a time. The oil should be at a heat when you drop some dough it should come up slowly, if the dough comes up too fast the oil is too hot, if it does not come up then the oil is cold. It will not be crisp if the oil is too hot. Nisha, These kachoris look awesome...I made them too for the ICC event...hope you enjoyed making these as much as I did!!! They look perfect, glad you tried and enjoyed them. I was eagerly waiting for kachori recipe ...Would try this definitely. Kachori look perfect, i enjoyed making them too. the kachoris have come out perfect!!! thank you for all those precisions and tips!!! 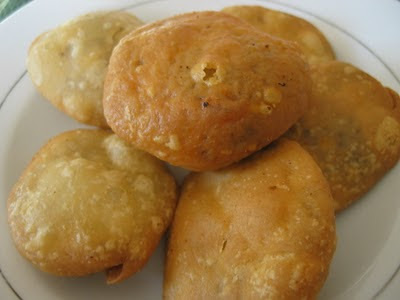 Kachoris are looking so cute... Love to have some now!!! Perfect for wintery evenings!!! You have an award awaiting in my blog. Pls accpect it. So neat that you shared your cultures savory pastry, it looks like a delicious treat--fried up golden and tasty!